Owned and operated by Rita Sehgal. After serving in India for a long period in threading field she start serving to the high desert people. Eyebrow threading is a practice of shaping the eyebrows. Eyebrow threading is a preferred hair removal technique for a number of reasons. Unlike tweezing or plucking, eyebrow threading removes one clean line of hair all at once, making it much quicker and easier to shape the brows. 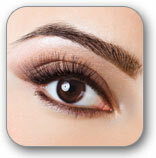 It is important to find an aesthetician who is experienced at eyebrow threading. Inexperience can result in uneven brows, hair breakage, ingrown hairs, or unnecessary pain. The powdered leaves of a tropical shrub, used as a dye to color the hair and decorate the body. The Old World shrub that produces henna, with small Pink, red, or white Flowers. Henna tattoo (Mehndi Temporary Tattoos) is an ancient Body Art. It is used in creating intricate ethnic or contemporary Tattoo designs and exotic patterns on Various parts of the body. Traditionally applied to the hands and feet of women preparing for special ceremonies. Henna tattoo is completely natural, non-permanent tattoo And painless. Men and women are finding it a nice alternative to permanent tattoos as the Designs fade in one to two weeks depending on skin. Our Henna is selected from The best Henna plants grown in India and the Henna paste is specially Handmade fresh to get the perfect blend of Color. It has NO chemicals or dye added and is completely Safe for children too. This place is great. I used to go to an another Eyebrow place but I was never treated like a customer. She is always in hurry. Last time she messed up my eyebrows and I had to use black marker. RITA you rock. Thanks for fixing other peoples mistake and giving life to my eyebrows.